Updates to McKenzi's profile since your last visit are highlighted in yellow. Keyan (2005), Dylan (2008), Ellie (2011), Alex (2012). McKenzi Milne Adams has a birthday today. McKenzi Milne Adams updated her profile. View. McKenzi Milne Adams added a photo to her profile gallery. 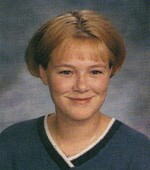 McKenzi Milne Adams changed her "Then" picture. McKenzi Milne Adams changed her profile picture. Oh - fabulous 90's hair!